Amish readers have enjoyed a variety of new publications over the past few years. One of my favorites is called The Connection. 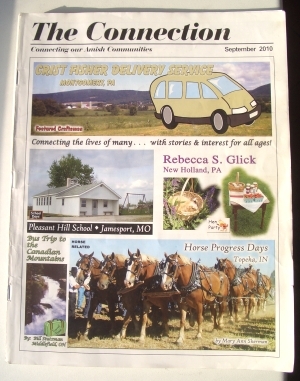 The Connection is published out of Topeka, Indiana, and features a variety of columns and articles written by Amish from around the country (as well as a few non-Amish). Two things that makes this publication different than more traditional Amish newspapers are its production value and also its voice. First of all, The Connection explicitly describes its audience as Amish in the tagline right beneath the title “Connecting our Amish Communities”. It’s an appealing motto and one that reflects the chief Amish value of community. Family Life, another one of my favorite Amish publications, does not have an equivalent tagline, though you do see other books and publications that contain something that states their intended audience. More significantly, The Connection‘s tone is lighter. It has a fun and breezy approach that you see throughout in everything from the illustrations to the editorial comments. Secondly, on its first page The Connection describes itself as a “magazine”. “Magazine”–with its connotation of glossy photo shoots and full page ad spreads–has a more worldly feel than black-and-white “newspaper” or generic “publication”. Though the interior has a newsprint feel, there is a lot of color throughout, and I think it’s an accurate description. The glossy cover and liberal use of color throughout give it a much different feel than Family Life or Die Botschaft, another long-running Plain publication. Imagery in the magazine includes depictions of Amish people, which in my opinion look like they were probably created with a basic computer graphics program. It’s a far cry from the plain black and white drawings in other Amish productions. One reason for this may be that The Connection‘s Publisher, from what I can tell by her last name, is not Amish (the magazine also offers an email address for correspondence). However the bulk of the editorial/writing staff seems to be. Amish partner with non-Amish in some situations in order to be able to produce products or use technologies to enable a business. 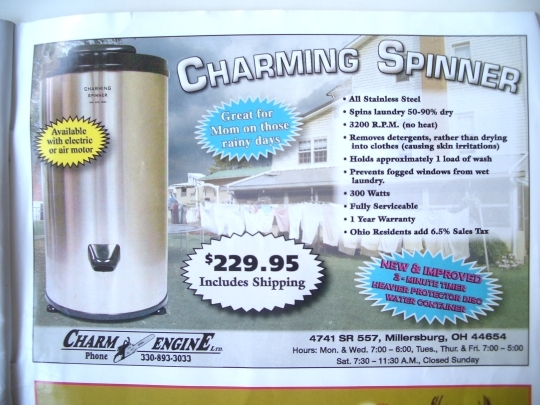 Another example would be an Amish bakery having a non-Amish partner who handles marketing, websites, and so on. The connection is pretty packed with information and material. You get a glimpse of what’s in store by the colorful cover displaying the magazine’s features. Among others, the cover sports a “Featured Craftsman”, with an accompanying article about the business inside and interview with the owner. 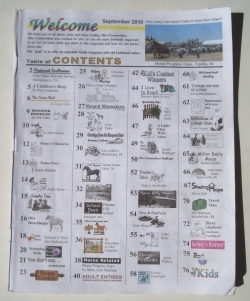 Each month a different Amish school is also featured up front and in the “School Days” section inside. The Connection features a wide range of monthly columnists writing under their own names. Columnists typically report from their communities, or write about a certain topic. Columns are quite personalized, featuring a “brand name” and logo. Columnists hail from a range of states, including Indiana, New York, Pennsylvania, and Ohio, as well as Canada. 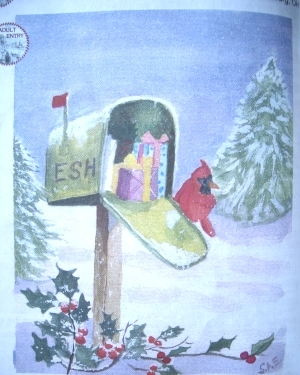 Examples include “Hen Party” (featuring correspondence from different Amish women, including recent contributors from New York and Pennsylvania), “Milroy Musings” (from the small central Indiana settlement), “The Poets Porch” (a column and accompanying poem written by an Amish father of 5), “Greetings from the Bluegrass State”, and “Swiss Gems” (written by an Amish woman from the Swiss Amish settlement at Berne, Indiana). And the range of topics goes beyond the weather and who happened to be born/married/died that month. In a recent column, the author of “Hoosier Doodles” writes about the U-505 German World War II submarine. Another Amishman describes an experience with a cookware salesman (the title, “Salesmen!!! !”, tells you about all you need to know about what happened). 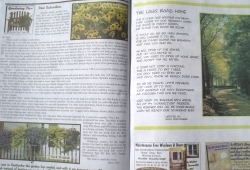 The magazine is filled out with lots of other nice tidbits, including gardening tips, monthly recipes, an auction report, book reviews, sudoku, and a children’s section providing games and puzzles. The magazine also actively seeks reader contributions. An “Adult Entries” section includes “original short stories and artwork” by adults, providing a creative outlet and a chance for aspiring Amish writers/artists to see their work “up in lights”. Family Life is a great publication, and still probably my favorite Amish-produced periodical. I would say it more strongly represents Plain values, both in its format and in the messages it emphasizes. The Connection is different in that it is lighter and more business-oriented. The two offer an interesting contrast in the types of writing Amish are doing nowadays. But both contain a heavy dose of “old-fashioned values”, which is what you would expect from anything read by Amish. Compared to Family Life‘s $12 yearly subscription price, The Connection is not cheap. However, the production value, and from what I can tell, the amount of content are both greater. 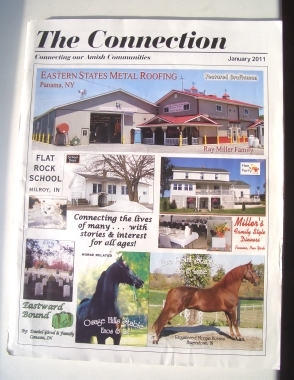 A NOTE FROM ERIK: The Connection is now an advertiser on Amish America; the above was written a few months before I met Mary Alice and the gang (read how that happened here), and before they decided to advertise here. Please include: Your Name, Mailing Address (Street/PO Box-City-State-Zip), Phone #, and Order Code “AMA12”. Id like to invite everyone to old order Mennonite Jeans post again on tuesday. She will explain in more detail about her plain life, and answers some readers questions as well.Please visit www.Amishstorys.com. Thanks folks.Richard from Lebanon county’s Amish settlement. Very interesting Erik. I never knew the Amish had so many publications. You are certainly right this one does look so much different than the few I have seen. I do have to wonder though, when or if a publication crosses the “plain” line and become “too worldly” or “too fancy”? A great question Alice. I am sure some Amish would consider this a fancy publication. What is interesting though is that some of the writers are from quite conservative communities, including New Wilmington, PA, and also the Swiss community at Berne. By the looks of it I’d say more are from generally more progressive places like northern Indiana. But it is an interesting mix. By the way, there is a new feature on the blog here–if you’ve ever lost your place in a conversation here in the comments, we’re now testing out “threaded comments”. Basically at the end of each comment you’ll see the link “Reply to Comment”. Using this to reply will put your comment directly under the comment you are responding to (like I’ve done with Alice above). Otherwise you can just leave a comment in the normal fashion and it will appear at the bottom as usual. Hopefully that will make it easier to follow a thread of discussion…We’ll see how it works! I just tried it Erik. I think it is a good idea. Thanks for adding it. This way you know your response to a particular comment will be placed by that comment and not get lost. Some subjects get a lot of responses. This will make it easier to reply to one particular response. Thanks!! Great! Looking forward to feedback as to what you all think about it. Since the weekend there are a few other small changes (I don’t know if anyone noticed 🙂 ) and have a few more in store. OK Erik, now that we have several comments threaded together I am not sure I like it this way. I see there are boxes sort of tying the threads together but it does seem to make the other conversations hard to follow. Take a look at genealogy.com and see how theirs are threaded. It might give you some ideas. The problem I see happening here is some will forget to hit the “Reply to Comment” in the post box and go to the bottom to do it when that should be used to start a new comment. (hope that makes sense). But to me it will wind up being more of a jumbled up mess than before. You might be right on that Alice. We’ll see here. At least on the one hand those that remember to use “reply to comment” will have their comments in order. With the original way, all comments go to the bottom, regardless of whether you want to connect yours to someone else’s or not. So at least there is the option. I am not sure if I am pro/anti yet either though. I am actually just working through the blog software and am not a programmer so am a bit more limited in what I can do with the comments system. But maybe we’ll see how this goes a bit yet. Of course Erik, and I might not care for it because I am not totally used to it yet either. I got used to going to the bottom to look for replies. Ya gotta teach this old dog a new trick, LOL. No worries, I know what you mean Alice 🙂 Basically, if it ends up generally helping the flow of conversation we’ll keep it, if not we’ll yank it. We’ll just let it ride for awhile to see. Also, the Comment Title function I hope is useful for finding/labeling a certain topic. I have been trying to remember that comment title too, but I see you have not, LOL. Geez, there might be hope for me yet and I just might get the hang of it, LOL. Well, I had better get offline and get to my laundry which I should have started a couple of hours ago. Moving slow this morning for some reason, LOL. Erik, do you think in general terms Amish are gradually becoming less conservative? Perhaps in a way that does not really compromise their core values in beliefs? After all they seem a little less conservative when it comes to business. Alice another good q, I’d say that the Amish are always changing, and some Amish are changing faster than others. Amish 100 or 200 years ago also changed but the contrasts were not so bold, since the distance from Amish life to mainstream life was not so great (ie, “back then”, horse transportation was standard, there were fewer gadgets, etc). Even the plainest Amish like Swartzentruber Amish change over time. The difference is some really emphasize putting the brakes on and are very slow to adopt change. And groups will always draw the line as to what is okay in different places. And some will eventually migrate away from the Amish into a more progressive form. This actually happened in a widespread fashion in the 1800s when many Amish joined more progressive movements and many became Mennonite. At the end of that century there were only about 5000 Old Order Amish. Guess I am full of great questions today Erik, or umm full of something anyway, 😉 LOL. Correct me if I am wrong but were not the Amish from the Mennonites originally? Then in the 1800s many went back to the Mennonites? I find that interesting. That is right Alice. When the Amish split off in 1693 the issues were mainly how shunning should be applied and also how often Communion should be held. I don’t know if we’d be able to tell a lot of obvious outward differences between the two at that point in time. You also had a variety of different movements and Mennonite groups in the 1800s. Steve Nolt in A History of the Amish does a much better job with it than I ever could, if you are interested further. Thanks Erik, I will have to see if they can get that book for me at the library. Isn’t it interesting they split, for what we might think of as “minor differences” at the time and today in general we hold the Amish in a higher esteem than the Mennonites or at least the Amish seem to be more popular as far as outsiders go? I am sure a lot has changed since then. Mike, thanks for bringing up Unser Leit. I keep hearing about it and it is on the reading list. I will need to pick up–or borrow ;)–a copy when I am back home in the US in a couple months. But I’ve heard it is a hefty read. On that random note I have been wondering lately (actually half-seriously) what Kindle penetration into Amish society is like. After all it is a pretty Plain device when you come down to it–black and white, doesn’t do much besides display books, and even the internet browser it comes with is pretty clunky, ie not video enabled, only loads one page at a time, refreshes slow (though somehow I’m still fond of it for its clunkiness). Ooops should say and beliefs not in beliefs, LOL sorry. I think i must have read almost all of these Amish publications, with the connection being one of them with a 1 year subscription at one time. I’m pretty sure quite a bit of the people who receive any one of these are non-Amish, and id love to see the demographics of the subscribers. Richard from Penn. Richard that’s something I’ve been curious about as well. 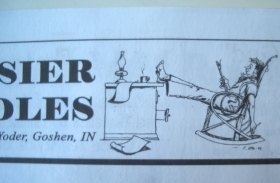 THE VENDER, a Holmes County Amish advertising paper, has about 2/3 Amish and 1/3 non-Amish readership. 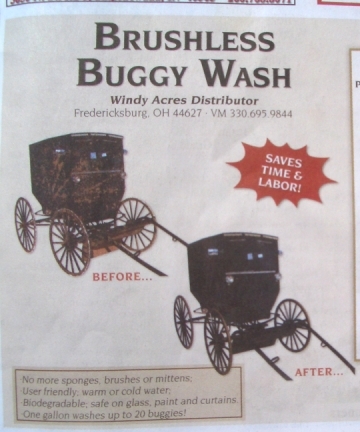 This paper goes into the majority of the Amish homes in Holmes County area. Thank you for this wonderful article. One of my husband’s favorite places to eat is in Topeka, Indiana–it’s called Tiffany’s. Thanks for the memories. I’ve never been to Tiffany’s but have fond memories of Topeka. One of my favorite “Amish towns”. Next time you are in Topeka, try lunch at Tiffany’s! We often pass the Flat Rock School in Milroy – Milroy is a wonderful – albeit somewhat progressive Amish community, but not quite so small anymore! If I correctly recall my conversation with of the members of the Amish Church there a few years back, there are apx. 120 families there. We recently attended attended their spring consignment school auction (it would have been more appropriate to call it a “mud sale” with all the rain we’ve had in the midwest US in the past month). They’ll have another one in the fall which is larger – they usually have about five or six auctions going on simultaneously at that one. If you haven’t been to an Amish auction before, it can be somewhat overwhelming, but well worth the experience (especially the food!). Matthew, great that you brought up Milroy. I spent 3 days in this community in 2004. Nice folks there. When I was there it was 4 church districts and according to the 2011 Almanac that looks to be the same today. I didn’t go to any auctions, but remember meeting a horse dealer, though I think he’s moved away since. The Milroy history is interesting–it is actually a bit of a combination of Swiss Amish and Pennsylvania Dutch Amish families, which is not typical. This is interesting, I am thinking about subscribing to one or more of these publications. On a different topic, have you already discussed or do you know anything about Amish life-expectancy as compared to the nation as a whole? Thank you for a great blog, I really enjoy reading it. Off the top of my head, I don’t know anything specific on Amish life expectancy. There may have been some studies but would need to check. You do see stories about Amish being fitter or healthier in some categories (off the top of my head weight, I believe some type of cancer) but don’t know how that translates into life expectancy (Just a note on weight I don’t know how skinny Amish are or how well the studies extrapolate over all Amish. Certain Amish have worse diets than others, and there are overweight and even obese Amish). Amish also face certain genetic diseases basically unseen in the general population. I’d also suspect that the incidence of death by accidents is relatively higher due to the farm work and manual labor orientation. On the other hand alcoholism is low as is tobacco use, compared to the general pop. I recommend “Family Life” especially if you have children. I have subscribed for many years. There are always nice stories, and puzzles for the kids. I have also sent in some comments and they have published about half of these. If an article brings up a question, a comment to the editor will normally generate a response. Hey, Erik, I like what one can do in the blog replies now. Usually I just type a person’s name and try to answer or comment. But it all works out in the end. I want to say that I appreciate the wonderful work you’ve done on and for this blog, very well done, sir! The Connection looks like an interesting publication. I have too much reading material to subscribe to these right now. Erik, on my monitor it looks like the “linked” boxes are only 1 or maybe two words wide per line. So that makes for a r-e-a-l l-o-n-g & s-k-i-n-n-e-y post. Is anyone else seeing this or is just unique to my view? Paul A. Miller do you work at the Mennonite Heritage center? Tom, Oldkat, thanks for letting me know about the skinny replies in the threaded comments. It’s set up to max out at 10 replies to prevent this. I do not see this but I have disabled threaded comments for the time being. Comments should appear as normal now. If you don’t mind sharing I am curious what browser you are using as this might be part of the issue. Or if you have a sec feel free to drop me a quick email at ewesner(at)gmail.com . Thanks and sorry for the inconvenience, we’ll just have to put the threaded comments test on hold for now. Erik, I had no problem with things getting smaller. But now I do not see the threading at all. Hi Alice, I suspect it is not a common issue, it may actually be related to the browser as well. If you read the comment above I wrote that I just disabled it for the time being until/if I can figure out why. I don’t have time now but am going to try to investigate a bit later today. Sorry for the fluctuations! The connection is a wonderful paper I know an amish lady that works there Mary Alice Yoder very sweet lady we have became good friends. Ooops,,,, I read that comment Erik but read it wrong. I thought you meant you disabled threads for your view only, LOL. Sorry about that. Hope you get it worked out and have a good day. Sure thing Alice no worries, you too! I picked up a copy of The Diary in Gordonville, PA a month ago. I thought about subscribing but I have to say, The Connection looks “more fun”. Erik, could you post a larger photo of the TOC so that I can see what sort of stuff I can expect in the The Connection. I have been photographying the Amish for some twenty five years and they have changed in their ways that reflect the need for growth and prosperity. They are not a static group. I do believe that within about 20-50 years they will have gotten to what we outsiders saw in the 1950s. Its a slow growth community that can’t stand stand still. The “Back to the Future” mentality is/has eroded greatly do to their own “need” to progress while standing still. They are a very loving and happy people and remind us all of a simplier time that they are moving away from faster then they want to admit. Enjoy the scene – it will be gone – sooner than a geologic eyeblink. I have an Amish house and land for sale or rent near Willard WI. The house is 1500 sq/ft with buggy garage and wood shed. There is also a large pole building 4500 sq/ft concrete floor and stable on one end. Building was previous used to build storage sheds and cabins. It has a storage loft, large sliding doors, etc., Located on a secluded dead end road. Land is apox. 5 acres. House and buildings are 5 years old. Large fenced garden. We manufacture and design furniture hardware for Amish furniture builders. 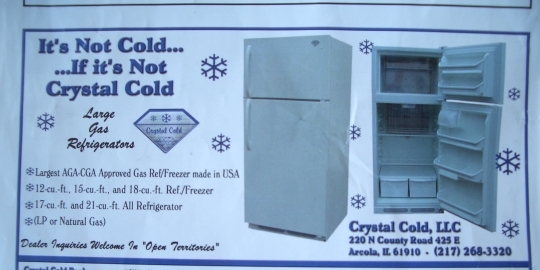 If anyone can recommend a publication we can advertise in that is focused on Amish furniture that would be appreciated. Not strictly furniture but that would be included. Thank you. We have several customers who are Amish Furniture Manufacturers and we’d like to grow in this segment of the market.